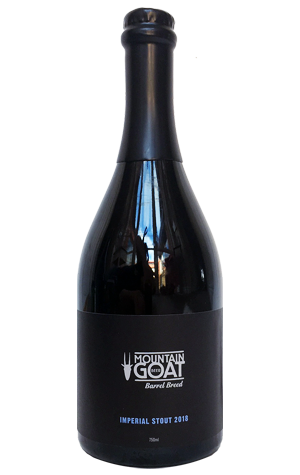 The wintry leg of Mountain Goat's Barrel Breed trilogy is back for 2018. As with this year's Barley Wine, the beer was aged in a number of ex Tennessee whiskey barrels before the contents of the best nine were blended to create the 9.3 percent ABV beer. As you'd expect with such a beer, there's a lengthy roll call of malts in the mix but, rather more intriguingly, there's also the appearance of a hop variety we've not seen in a local beer before (at least not knowingly). It goes by the snappy title of "American Dwarf Hop Association Experimental #529" and a little flitting around the web suggests it lends a beer scents of coconut, lemon, tea and mint. Quite how much of that you're expected to pick up when there's so much else at play is a moot point, but what you can be sure of is a mouth-coating doona of a beer, one stuffed with dark fruits, rich chocolate, toffee, hints of the barrels' past inhabitant and just a hint of drying roast. Pull up a comfy chair, put on some choice tunes and slip inside.